SANAA, Yemen — Cholera is surging once again in Yemen, with the U.N. reporting that the number of suspected cases has doubled in March over previous months and doctors in overwhelmed health facilities fearing it could rival a 2017 outbreak that spiraled into the world's worst flare-up. The surge underscores how Yemen, which has endured multiple outbreaks of cholera amid four years of civil war, still isn't able to stop its spread. At al-Sabeen Hospital in the capital of Sanaa, beds are full and patients sleep in tents in a courtyard. Some of them wait for treatment by lying on cardboard under trees, with IVs dangling from the branches. "We receive cases around the clock. Sometimes three to four cases a minute," said Dr. Ismail al-Mansouri. "The hospital is under heavy pressure, as it receives patients from across the country." Even the doctors are not immune: Al-Mansouri and several other staff have caught cholera. On March 28, one of their colleagues, a well-loved pediatrician, died of the disease. Two other outbreaks since 2016 caused more than 1.4 million suspected cases and killed more than 3,000 people. Most of those stemmed from an outbreak that began in April 2017 and grew into the world's biggest. The spread has slowed since late 2018, although it never stopped. Now, seasonal rains that began earlier than usual this year have caused a spike in the disease. There were 76,152 new suspected cases and 195 deaths in March, compared to about 32,000 cases in February and 39,000 in January. The March toll brought the number of those believed to have died from cholera this year to nearly 300. The rates last month are comparable to the first weeks of 2017, when cases jumped to 10,000 and 20,000 a week. It accelerated to 50,000 a week at its height and went on to infect more than 1 million people before waning in mid-2018. "The outbreak this year is much worse and the situation is very dangerous," said Adel al-Alamni, head of the cholera treatment center at al-Sabeen. In a statement last week, the U.N.'s World Health Organization said it was "doing everything possible to avoid the 2017 scenario." But it noted it faces restrictions on access and "bureaucratic hurdles" to bringing in supplies. Speaking to the AP on Friday, WHO spokesman Christian Lindmeier said rates of cholera fatality overall this year are still lower than in 2017, but the situation is exacerbated because of the early rains and because "infrastructure is more destroyed than it used to be." Cholera is spread primarily by water and food tainted with feces. It usually can be treated if caught early, but it can kill swiftly by dehydrating its victims through vomiting and severe diarrhea. 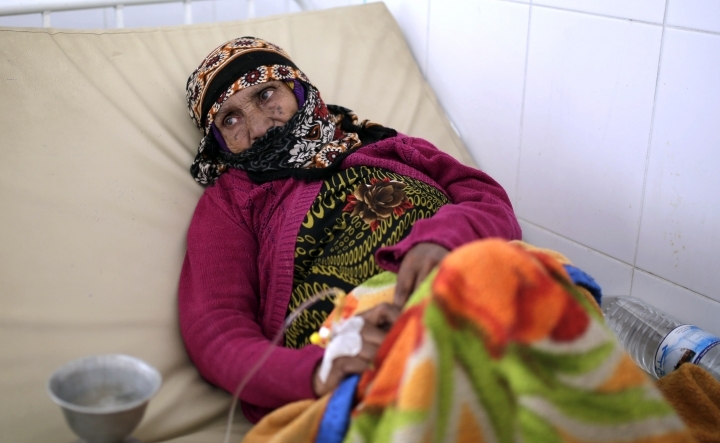 The destruction wreaked by Yemen's civil war has created prime conditions for cholera's spread. The conflict is between Shiite rebels known as Houthis who control the northern part of the country and a Saudi-led coalition backing the internationally recognized government, based in the south. Fighting and airstrikes have damaged sewage systems and water stations. Most people don't have access to clean water, particularly the more than 3 million driven from their homes by the war. The main water treatment facility outside Sanaa has broken down. Sewage water is often used to irrigate fields, potentially infecting food supplies, and it leaks into wells, the main source of water. Health services and trash collection have further broken down because about 1 million government employees have largely gone unpaid since the Central Bank was moved in 2016 from Houthi-controlled Sanaa to the southern city of Aden. Nearly half the prewar health facilities are no longer working, often because they were damaged by airstrikes. The cholera adds to what is already the world's worst humanitarian crisis. Nearly two thirds of Yemen's 23 million people are in need of some sort of aid and possibly tens of thousands have died of malnutrition, preventable diseases and epidemics. 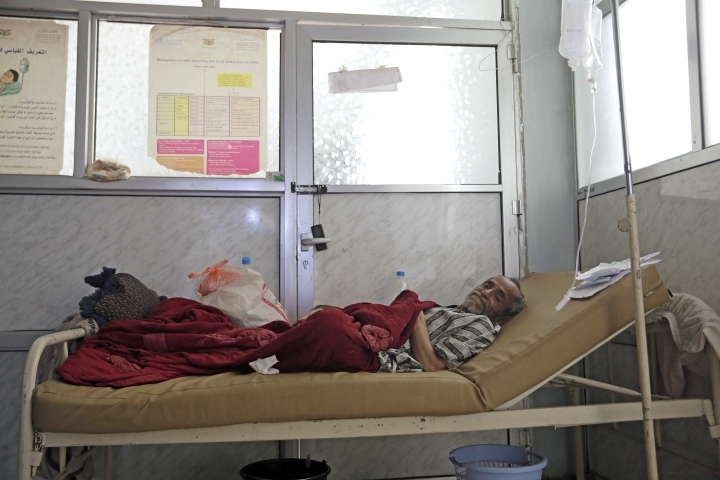 The surge in cholera has been centered in districts around Sanaa and other parts of the north. The relief agencies Doctors Without Borders and Save the Children warned last week of an "alarming spike" with 1,000 children infected with suspected cholera every day. Most of the patients at al-Sabeen Hospital are children under 10, al-Mansouri said. Among the most recent deaths were two pregnant women, along with their unborn babies. Among the dead was al-Mansouri's colleague, Dr. Mohammed Abdel-Moghni, who had treated children during the recent waves of cholera. His colleagues and family believe he was infected as he did his morning rounds, checking the dozens of patients in his care, before having breakfast at the hospital cafe. He died of kidney failure, a common complication from cholera. Health workers dealing with cholera patients have not received vaccinations, al-Mansouri said, noting doctors are left without protection. Infection control in health facilities is almost nonexistent because of the lack of resources, making staff vulnerable, he said. Hardly anyone in Yemen has been vaccinated against cholera. U.N. officials have said agencies largely have been unable to bring in vaccines because of the difficulty in delivering them amid the conflict. The only vaccination campaign so far took place in a few districts in 2018 and covered 400,000 people. Parents have struggled to get cholera-stricken children to treatment. At al-Sabeen Hospital, Mohammed Hadi said he brought his 3-year-old daughter, Naama, from their eastern home of Radda, hoping to get treatment at a private facility, but it was too expensive. So they were camped out at al-Sabeen, where treatment is free, sleeping in a tent for two days and then found space on the floor in a room crammed with 19 other patients. Naama has had the symptoms of cholera. Hadi, a farmer, said he was still trying to figure out how she was infected. "Is it water? We know that the water is polluted. Is it the food?" he said. "Look at my daughter's condition. It's very hard." Activists have launched awareness campaigns on social media, warning against eating uncooked vegetables. Messages are sent on WhatsApp groups urging residents to sanitize water tanks, especially those next to underground sewage tanks. The United Nations asked for $4.2 billion for humanitarian operations in Yemen this year, and it listed stemming cholera as a top goal. It set up hundreds of Diarrhea Treatment Centers and Oral Rehydration Corners across the country. But in some areas, such as the densely populated city of Taiz, several centers are not working because of delays in aid, according to a senior health official in the city. He spoke on condition of anonymity because he had not yet talked to U.N. agencies about restarting support for the centers. Doctors say deaths can still occur from complications that the U.N. centers can't detect. The centers, for example, are not equipped to deal with kidney failure, said Dr. Jamal Abdel-Moghni of al-Thawra Hospital, one of Sanaa's biggest. It is one of only two facilities in Yemen that are able to treat kidney failure. "The numbers of people who come to our hospital for cholera complications are just unimaginable," said Abdel-Moghni, a relative of the doctor who died. "Every day there is death, and the day that passes without deaths is an exceptional day." AP correspondent Jamey Keaten in Geneva contributed to this report.